I am so sorry that I could not update my English blog for a while. I conduct Tenkara classes periodically in Japan. In addition to regular fishing classes, I often go fishing with the students who have attended the classes by camping or visiting my home water, which means I teach Tenkara throughout the year. My students skills vary: from novices to the advanced who have been doing Tenkara over a decade. There is also a variety of fishing water. Some like main streams, others like small streams and also others like headwater. Preference may vary, but what they want to fish are iwana char and amago. They exhibit the same behaviors in the water: where they hide, what they eat. I am quite versed in the fish behaviors; I can teach to my students. What is important for Tenkara is strategies. Do not rush to cast a rod. Calm down and look to the conditions of the river ? how many fishermen (this factor is very important since Japan is infamous for the fishermen density) are already fishing before you, how active the fish are, the wind, water level, water color, water temperature, what insects are hatching or flying. Then, decide on the size of line, tippet and the fly to use. Looking at my students, they do not seem to have their own strategies ? where to stand at the river, in what order to fish upstreams. 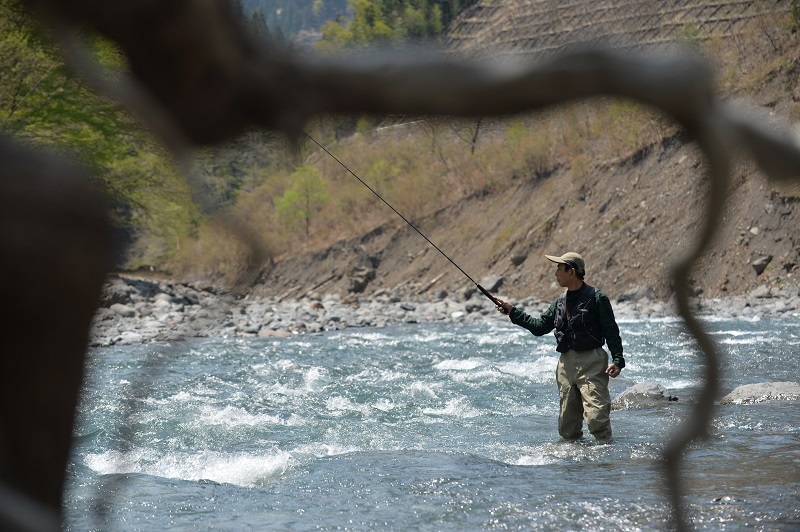 The longer their Tenkara experience becomes, the more strategies fishermen can establish as their own. You succeed sometimes and lose sometimes. Answers for successes can be obtained from fish. As there are too many fishermen in Japan, actually going fishing on weekday when most of people cannot go is one of strategies. 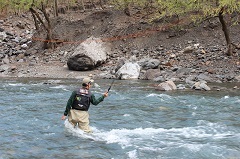 Especially since Japan tries to protect stream fish by banning fishing during their mating season which is from October to February, the opening fishing day which is usually March 1 is the busiest day and the toughest day. Good fishing streams are limited and with a large number of fishermen, the fishing areas like headwater and small streams which have beautiful sceneries will be highly congested. Such congestion sometimes causes some troubles between fishermen. Fishermen want to catch fish with ease. 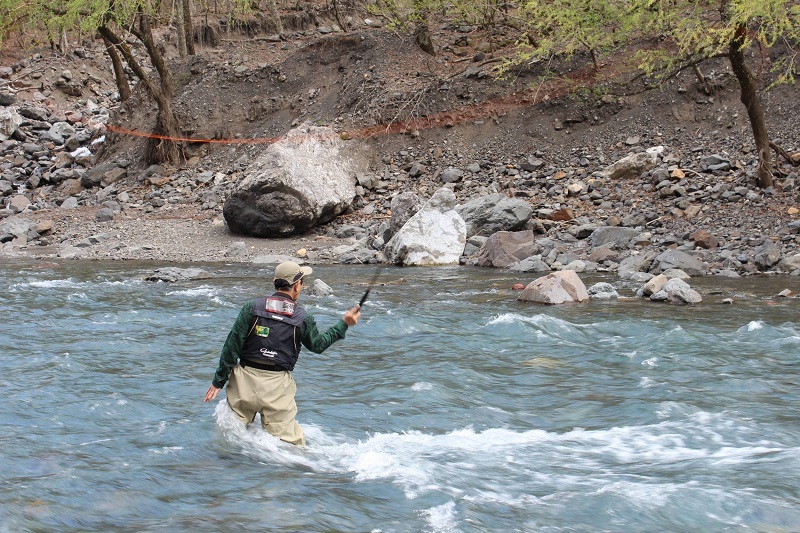 Therefore, I decided to fish main streams where water is strong in current and less crowded. It is also necessary to make a longer cast than at small streams, which makes fishing tougher and the area less people. Fish are bigger in such places and you can cast so freely and comfortably, which resulted in my invention of long line. For your knowledge, I suggest one thing. The mistake most of students who come to Onijuku make is the standing position at the river. 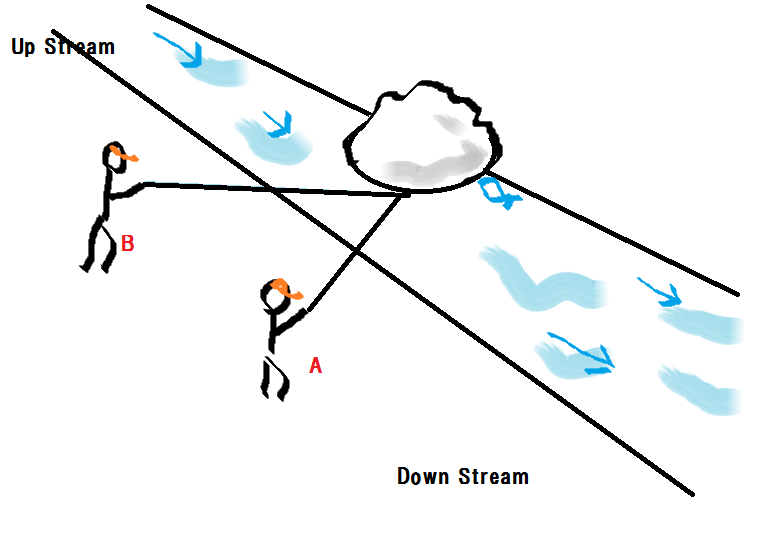 As you see the illustration, if you fish from downstream and feel fish under the rock, do not stand at A position. That will be the mistake as the fly is swept away toward downstream. Move up to B position and put the fly around the rock, and the fly can stay（TOMEDURI）. It is better to show the fly to fish as long as possible because it creates more possibility for fish to bite the fly. And if nothing still happens , go down to A position and put the fly in the back of the rock. 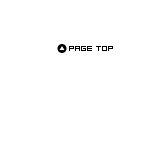 I will tell you more techniques next time. So, Tenkara fishermen, have a great fishing! Thank you Mr. Sakakibara for your expert information. Hi Jeff Thank you too. I will my best ,I will teach you more and more. Send me your fishing photo. A pleasure to have you writing a blog in English! Looking forward to reading more. I fish tenkara in New York and Connecticut mostly. I often use western flies, but I want to learn more about how to fish the kebari fly correctly. Yes.I try to teach about tenkara.Thank you too.